What is Medication Reconciliation? Why Isn’t It as Easy as It Sounds? This seemingly simple process serves a critical role in ensuring patient safety and preventing harm from medications or adverse drug events (ADEs), and has been included as one of the Joint Commission’s National Patient Safety Goals since 2005. Medication reconciliation has proven to have a decidedly positive impact on patient outcomes. In a report issued by the Agency for Healthcare Research and Quality, several studies are referenced highlighting medication reconciliation’s potential to reduce ADEs. One such study that examined medication reconciliation improvement efforts rolled out over a seven-month period showed that these efforts successfully decreased the rate of medication errors by 70% and ADEs by more than 15%. Despite its straightforward definition, the realities of medication reconciliation are far more complex. Medication-related errors, which are often linked to an incomplete or inaccurate medication lists, impact more than 7 million people in the United States annually and cost approximately $21 billion annually across all care settings. So, if medication reconciliation sounds so simple, why are medication-related errors such a major issue? In this post, I will discuss a few reasons why performing a complete and accurate medication reconciliation often presents significant challenges for healthcare providers. This problem is even more prevalent with elderly patients. An article published by the American Pharmacist Association, citing data from the Agency for Healthcare Research and Quality, notes that more than 60% of adults in the United States older than 65 years take at least five medications each week and 15% take at least 10. It is not surprising that recall can be an issue. A study published in The Gerontologist of elderly patients visiting clinics specializing in care of the elderly found these patients failed to recall nearly half of their medications recorded in the chart. During market research conducted here at Cureatr, we spoke with dozens of clinicians and found that there was no consistent owner of the medication reconciliation process. The person or people responsible varies based on the place of service. In the emergency department, for example, medication reconciliation is sometimes performed by the physician, sometimes by the nurse, and sometimes by the pharmacy technician. In the doctor’s office, medication reconciliation could be the responsibility of an admitting nurse or physician. 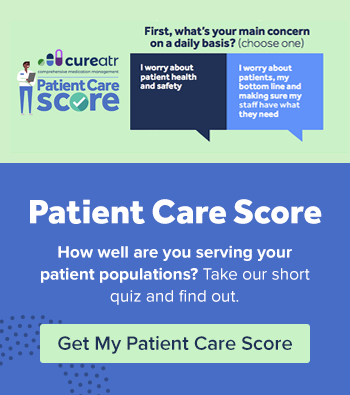 Without a consistent owner who is held accountable for the process across care settings, the likelihood of inaccurate or incomplete medication information greatly increases. Nearly all electronic medical record (EMR) systems now have and continue to refine functionality intended to help streamline and standardize medication reconciliation processes. 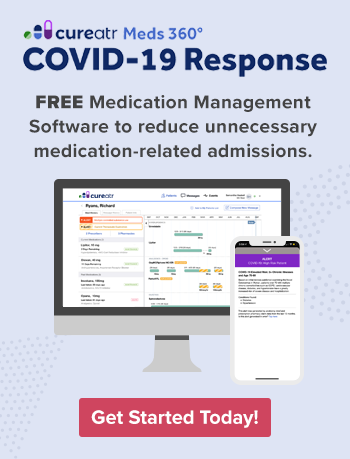 Most EMRs have what is commonly referred to as a “checkbox” function to reconcile patient medications that have been discontinued, changed, or added. This function prompts clinicians to check a box next to each medication listed in the patient’s chart while conducting the medication review. In a perfect world, this process would be sufficient for reconciling medications. In reality however, these features may only satisfy regulatory requirements, while data quality, usability, and workflow issues can pose significant risks to patient safety. Most healthcare providers are acutely aware that medication lists within their EHR, even if accurate, likely only represent those medications ordered within the four walls of their enterprise. They are equally aware that the type of interoperability required to completely connect the dots of a patient’s medication history across the care-continuum doesn’t exist. The time thus required to verify all medications for even a moderately complex patient isn’t practical given the overwhelming volume of patients clinicians typically handle on a daily basis.